The port of Brightlingsea needs no introduction to boat anglers, but the varied shore sport on offer is often overlooked. Best marks are the wooden groynes in front of Brightlingsea sailing club, Splash Point, Bateman’s Tower, the sea defences along former railway line towards Alresford, Stone Point at St Osyth, Point Clear Bay, Leewick sands and The Stone at East Mersea. The early months offer flatfish. Whiting from September to March, during which rockling, smelt and some codling show. School bass from April until January, while better bass are caught in the autumn. Mullet in the weed from Bateman’s Tower to Alresford creek. Eels until September. Rays are caught from May until August. Flounders to rag and lug; crabs better in spring. Whiting take lug, rag and squid or fish. Bass fall to rag and lug, with peelers better in spring and summer. Use a sandeel, fish head or squid for better bass. Rays fall to king rag and peeler crabs. Codling like lug and rag, and frozen crabs. Flounder rigs are either three-up or two-up and one-down. Long traces of 15lb are good, with size 6-1/0 fi ne-wire hooks. Booms can be used for flounders. Try a running leger and size 4/0 hook for better bass. Rays need stronger tackle, with size 2/0-4/0 on bomber or Pennell rigs. Brightlingsea: Leave the A12 at the Colchester turning and follow the A133 to Wivenhoe Park Corner. Take the B1027 to Thorington crossroads and the B1029 to Brightlingsea. Parking is in Oyster Tank Road or off Promenade Way. Mersea: Take the B1025 from Colchester to Mersea Island, over the Strood and left to East Mersea. Parking is restricted. Stone Point: Take the A133 to Clacton and B1027 towards St Osyth. Go to the crossroads, past the Priory and to the caravan park. Brian Dean Tackle, 43 Palister Rd, Clacton, tel: 01255 425992. 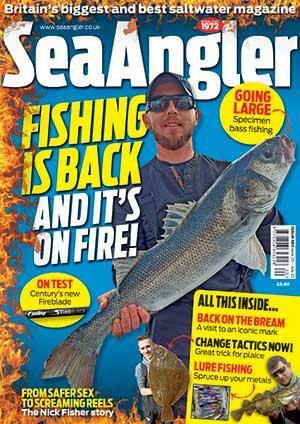 Colchester Bait and Tackle, Harwich Rd, Colchester, tel: 01206 860649. Meta-lite Tackle, 15 Newgate St, Walton-on-the-Naze, tel: 01255 675680. Porter’s Bait & Tackle, Barrack St, Colchester, tel: 01206 795757.